The Mel Blanc Show was a situation comedy broadcast from 1946 to 1947. 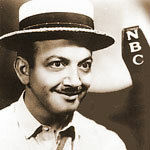 Mel Blanc, a popular and talented actor in Hollywood, played as himself in the show. The lead role Mel Blanc ran a repair business called the "Fix-It Shop." Blanc also portrayed the shop's helper, Zookie. Mary Jane Croft played Mel's girlfriend, Betty Colby while Joseph Kearns as Betty's grouchy father, an owner of a supermarket. The unique feature about the show is Mel Blanc's vast range of voice characterizations. He is able to adopt different dialects and accents which greatly add to the show's dramatic and comic effects. The storyline centers around Blanc's efforts to impress Betty's father, Mr. Colby. He invariably fails to win any favors and very often, if anything, makes Mr. Colby more dubious about him. Indeed, Blanc isn't much of a serious repair man, as most items leave his shop in worse condition than ever!